This is Adora to share a layout featuring the brand new, Quick Quotes "Just Because" paper collection! 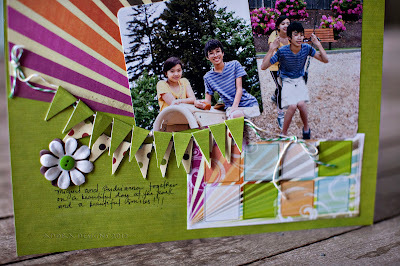 I am so excited to share this project with you today, I LOVE this paper collection!!! One of my favorite paper lines :). Here is a closer look! What I love about this layout is the color contrast and green is also one of my favorite colors of all time. 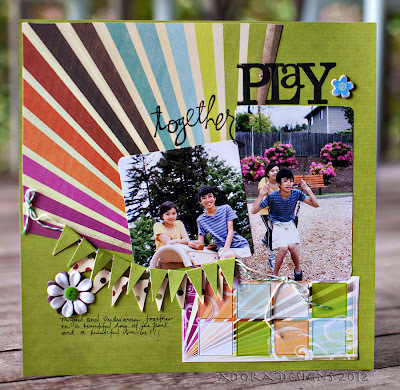 The sunburst pattern on the paper draws your attention right onto the photo and the green background makes the color on the patterned paper pop. Thanks for stopping by..........until next time! Thanks for the idea with the sunburst! I will have to try it :) It really pops. Great layout-I love the colors! Great layout! Love how you used that sunburst paper! Like the rays of colors on the paper and how well it looks with the banner pennants. I agree that your use of the sunburst does draw you right into the photo. Wonderful layout! I love the layering of the banner pennants! The colors are so vibrant! Another hit!! Really beginning to like that sunburst paper!! Fabulous LO! I love this paper! And your banners are too cute! The pennant is great! Love the paper too. Adora, this is a stunning layout! I love the rainbow paper!! The colors are so vibrant, lovely layout. Fabulous layout and loving the new papers! Gorgeous layers! Gorgeous!! I love the way you used the "rays" on this LO!